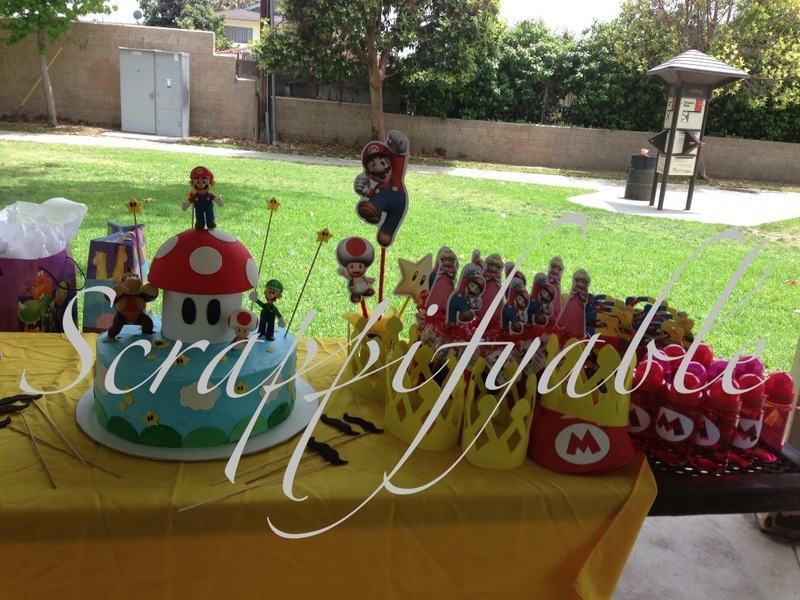 I am so excited to finally share the Super Mario birthday party we threw for my son’s 4th birthday. It was a ton of work but super fun to make. Paper: Core’dinations white premium cardstock. 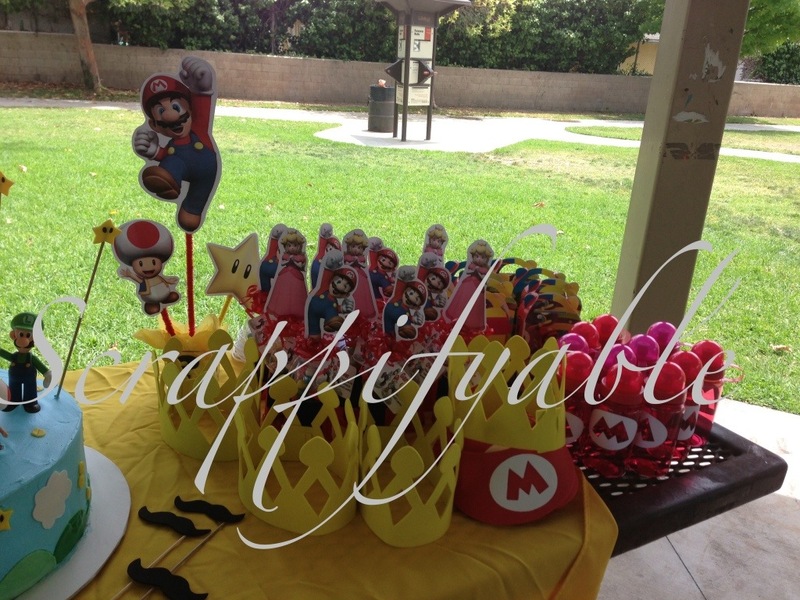 Tools: Xyron 5″ create a sticker, cricut imagine, Mickey and Friends font cartridge, Jasmine cartridge, Disney Happily Ever After cartridge, pop dots, crop a dile big bite, hot glue gun. Materials: Fibrecraft 12” 6mm Chenille Stems, Fibrecraft 2mm Foam Sheets, black cricut vinyl, pink silhouette vinyl, white vinyl, square vase, floral foam squares, wooden kakob skewers, foam visors, water bottles, mini gumball machines and a lot of printer ink. I found these fabulous Mario images online. I downloaded all the characters I wanted to use and printed them on white cardstock. I used Core’dinations white premium cardstock from Joann’s. I wanted the centerpices to be double sided so I printed each image twice. I used the mirror setting on my printer to get the backside of the image. Once printed, I cut them out by hand (my hands were sore for a few hours after that!) I left a small white border around each image. There was no way I was going to be able to cut each image perfectly, without cutting into the image. I ran the mirrored image through the xyron, hot glued a wooden kabob skewer in the middle to hold the image up. 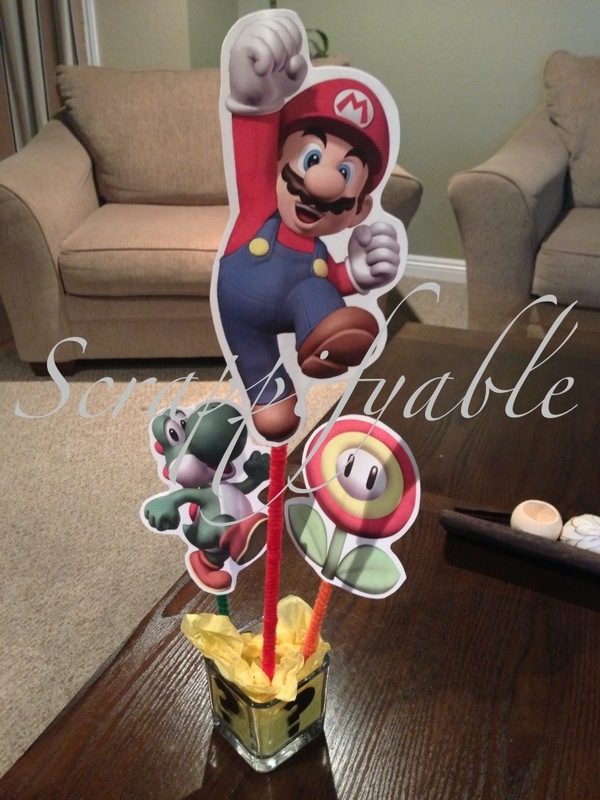 Covered the skewer with a chenille stem, aligned both pieces of cardstock together and ta-da I had my very own Super Mario kabob lol. For the base I used a small vase, floral foam square, and yellow tissue paper (all from the dollar store). 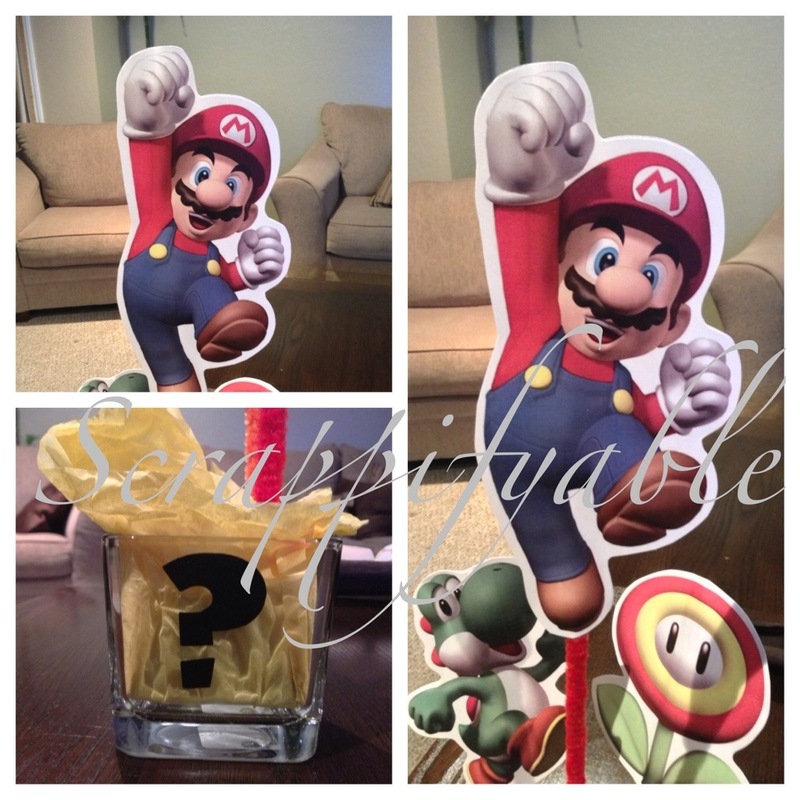 I added a black vinyl question mark (Mickey and Friends font cartridge) to each side of the vase. I couldn’t find a Mario hat anywhere 😦 but I ran into these cool foam visors at Michaels. I used the cricut craft room to weld the M (Mickey and friends font cartridge) and the oval (Jasmine cartridge) together. 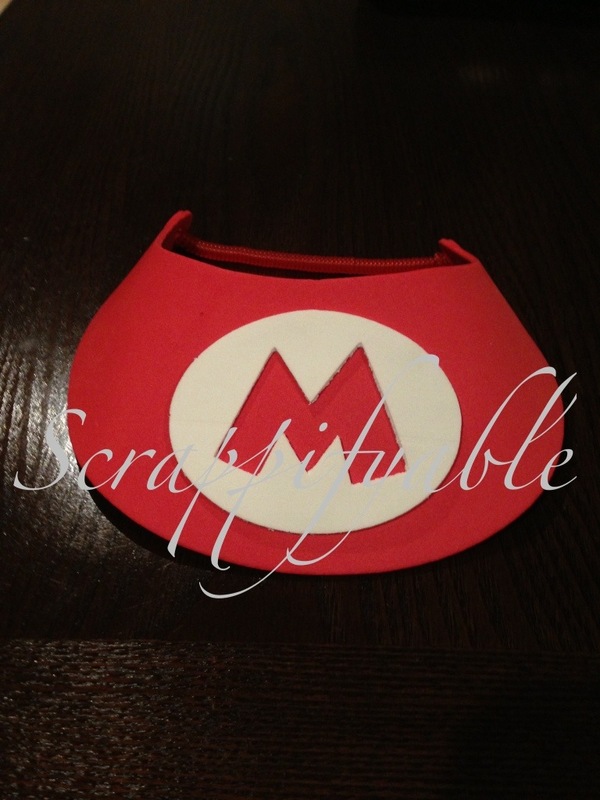 Once cut I hot glued the M to the visor. 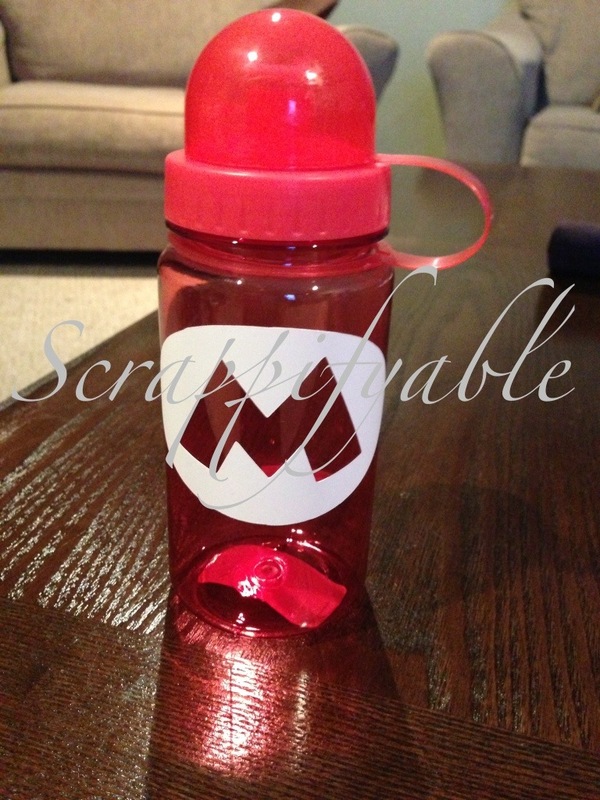 For the water bottles I used the same Mario hat logo. I used some white vinyl I already had in my stash. 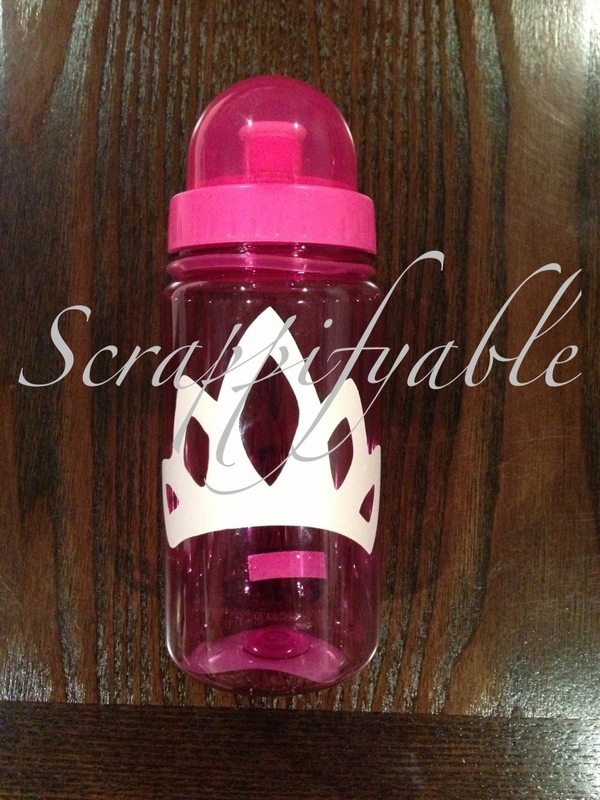 The girls got a princess peach water bottle. Using the Disney Happily Ever After cartridge I cut this super cute crown with pink vinyl. 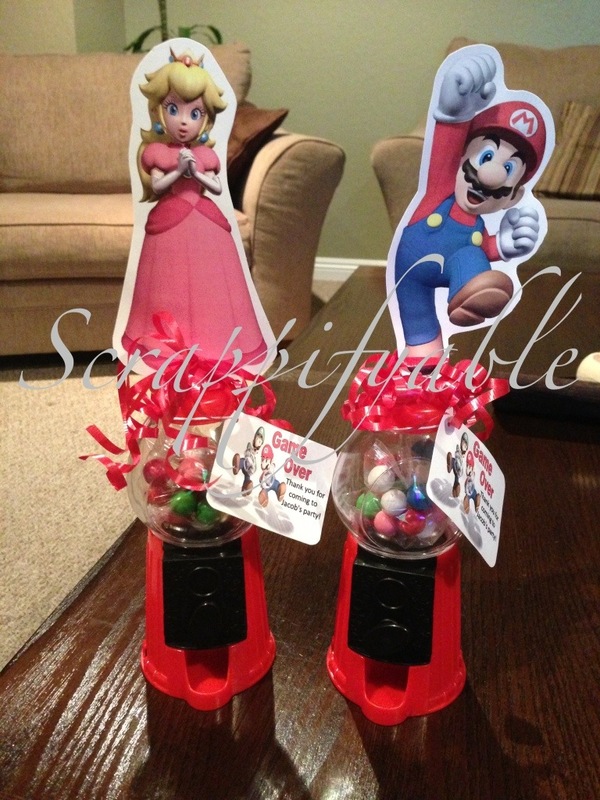 Found these adorable gumball machines at the dollar store. I attached the characters at the top with pop dots. Added some curling ribbon and a little thank you card. Phew! And that’s it. 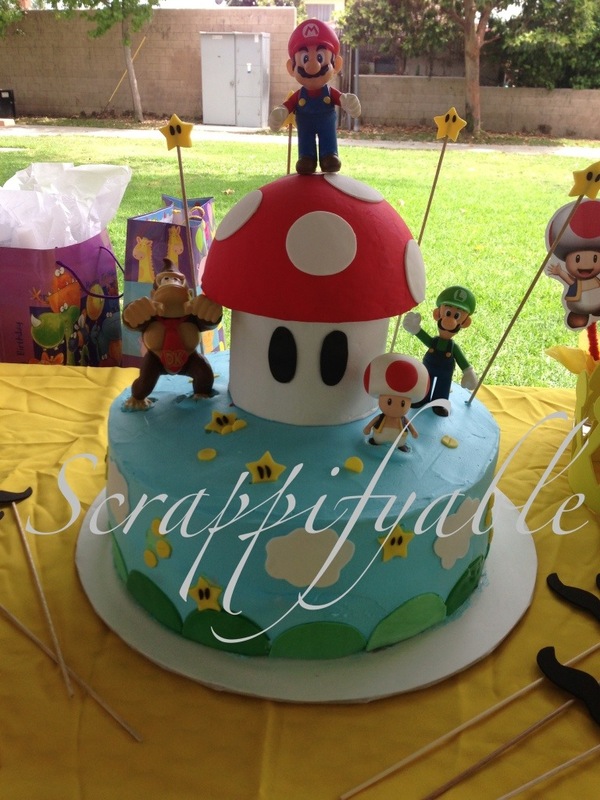 My son had a wonderful time and everyone enjoyed the Super Mario madness. Oh and did I mention my husband and I decorated the cake. Our first time ever working with fondant. I think we did pretty good (for two beginners who didn’t have a clue what they were getting themselves into). That’s a story for another day ; ) have a good night!